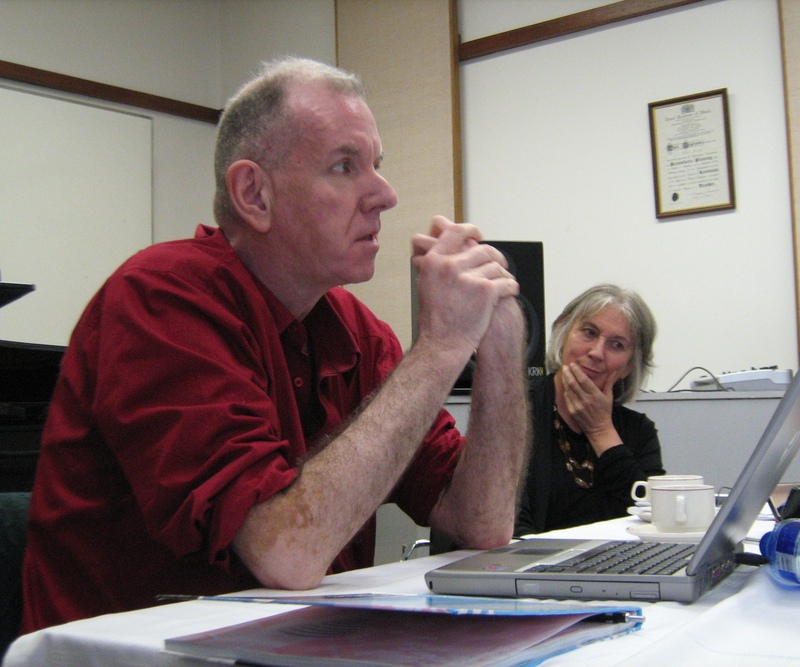 In 2009, with the collaboration of Professor Christine Lucia, DOMUS applied for and obtained a National Research Foundation KIC Grant to host a morning symposium and lunch in celebration of the sixtieth birthday of composer Kevin Volans. Extraordinary Professor in the Department of Music, Christine Lucia, convened the symposium programme consisting of contributions by Prof. Jean-Pierre de la Porte (Institute for Advanced Studies in Architecture and Infrastructure in Johannesburg), Jill Richards (pianist), Theo Herbst (University of Stellenbosch) and Mark Brand (Nelson Mandela Metropolitan University). The symposium was compellingly introduced by Lucia, who has been working on a Volans book for some years. 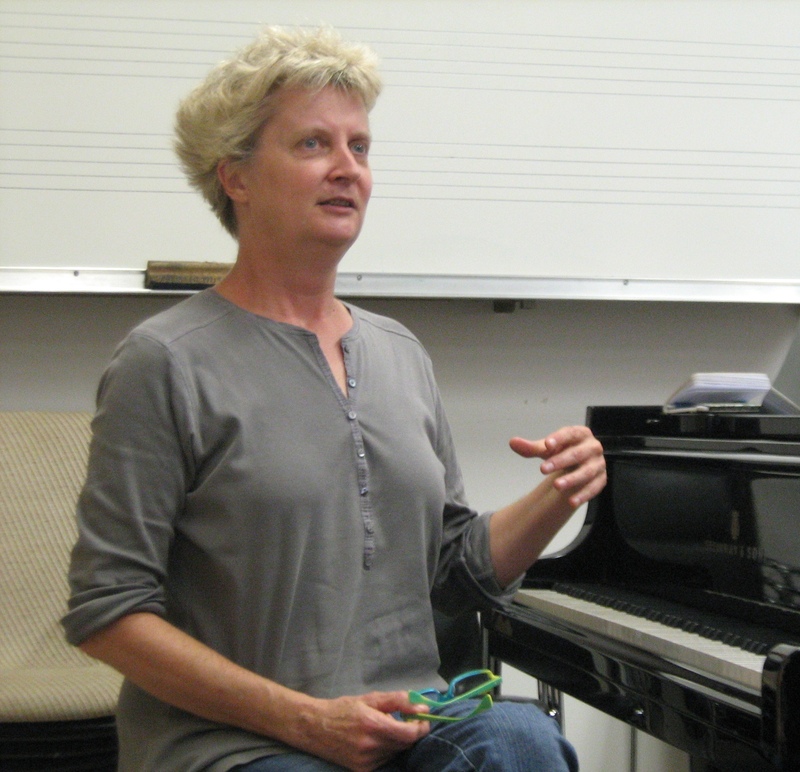 Symposium proceedings on Sunday 16 August were preceded by a KEMUS performance of Volans’s first six piano etudes for piano by Jill Richards the previous evening in the Endler Hall. 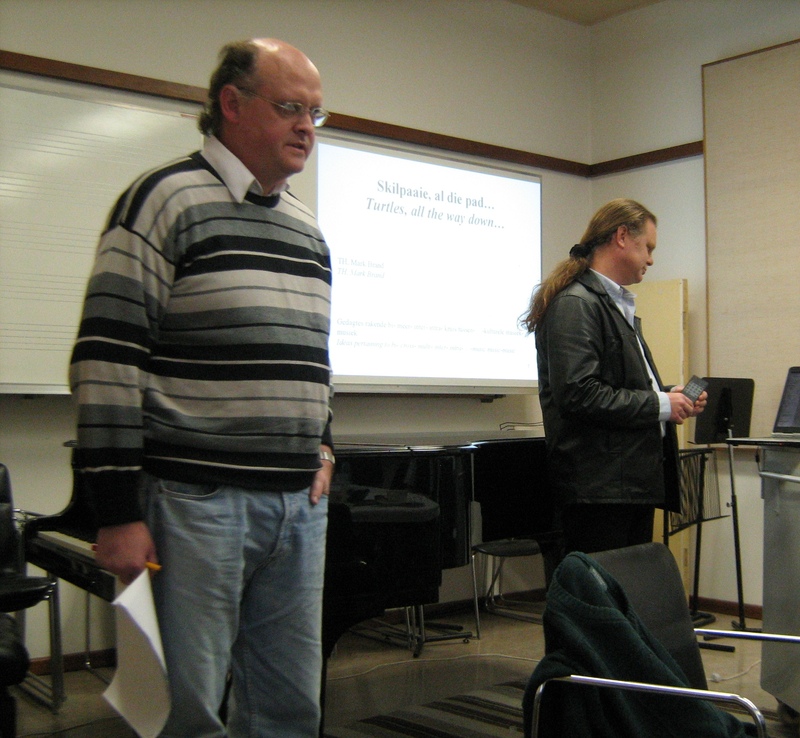 Richards’s simposium contribution the next day consisted of informal ruminations on Volans’s piano music and her relationship with this piano music and its composer. De la Porte’s paper focussed on Volans and pictorialism and departed from his analysis of Volans’s 1986 Darmstadt address. Herbst and Brand teamed up to provide a discussion of a detailed computer-assisted wave analysis of short audio samples from the two versions of Volans’s early composition White Man Sleeps. DOMUS obtained enough KIC funding from the NRF to help sponsor a special edition of the accredited journal SAMUS (South African Music Studies) of the South African Society for Research in Music (SASRIM), which will be based on proceedings from the symposium and will be dedicated to Kevin Volans. “Classical music ground-breakers proved true to form by taking many of the plaudits at this year’s RPS Music Awards, the UK’s most prestigious accolades for live classical music. Composers Kaija Saariaho and Kevin Volans, the London Sinfonietta, the Huddersfield Contemporary Music Festival and conductor Oliver Knussen all emerged triumphant. Philharmonia Orchestra's innovative re-rite project scooped two awards". Volans won the “Chamber-Scale Composition” category with his duo viola:piano, premiered by Garth Knox (viola) and Kevin Volans (piano) at the Volans Day at the Wigmore Hall in October 2009. It is described on the RPS website as “a distinctive distillation of the mysterious magic of Kevin Volans's recent music. It’s a piece that is spare yet rich, abstract yet expressive, economical in its resources yet maximal and memorable in its impact, and which will go straight to the heart of the viola duo repertoire”. The work has not yet been performed in South Africa. The jury for this category comprised Tom Service (Chair), David Alberman, Colin Matthews, Graham McKenzie, and Jane Williams. “Nearly four hundred guests from the music profession attended the ceremony which was hosted by BBC Radio 3’s Sean Rafferty and Sara Mohr-Pietsch and presented by past RPS Award winner Sir John Tomlinson. The keynote speech was given by artist Grayson Perry. The RPS Music Awards are presented in association with BBC Radio 3 who broadcast a programmed dedicated to the Awards Winners on ‘Performance on 3’ at 19:00 on 12 May 2010. It will then be available on ‘Listen Again’ for seven days. 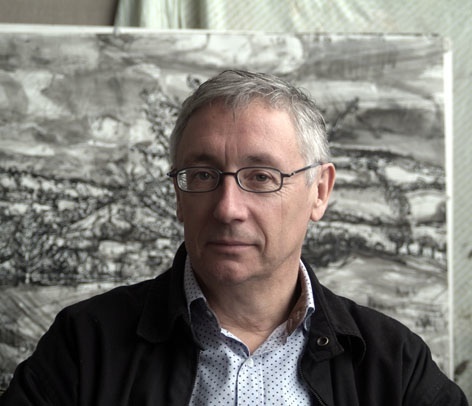 The two other shortlisted nominations in the “Chamber-scale Composition” Category were Pierre Alexandre Tremblay for Un Clou, Son Marteau, et le Béton and Huw Watkins for Piano Trio.